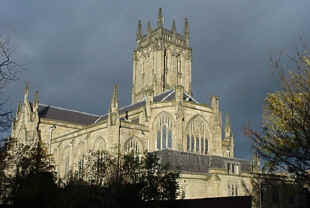 Leeds Parish Church, the big Anglican church in the city, with Erika and Susan. The night of our gathering the two of them stayed at Haley's Hotel where I stayed. May I say what a pleasure it was to meet Susan and Erika in real life? I wish we'd had more time to visit, but I'm pleased we had what time we had. I wanted to link directly to the history page of Leeds Parish Church, but the hosts want you to visit the home page first. Click on "Back to History" on the home page, and that will take you there. We had to park a good distance away, after a rather long ride round and round the road that circles the City Centre in Leeds. From the circle, you can see the place where you want to go, but the difficulty is in finding the right exit from the circle to actually get to where you want to go. After we parked the car, as we approached the church on foot, we heard change ringing. What a delightful surprise! The first and only other time that I heard change ringing was at St. Martin in the Fields in London, quite by accident. I was so excited, and I knew what it was that I was hearing, because I had read THE BOOK on the subject, The Nine Tailors by Dorothy Sayers. Listen to one of the peals from Leeds Parish Church. Isn't it lovely? It sounds like angel music to me. I suppose that some of you folks in England take the pleasure of change ringing for granted, but try to imagine my excitement in hearing it for only the second time in my long life. Erika, Susan, and I were seated by the very nice lady usher in a place of honor directly across from the pulpit, pictured above. We were somewhat awed and a bit concerned that someone would ask us to move to a lower place, but that never happened. The service was lovely with the men's and boys' choirs doing the honors. 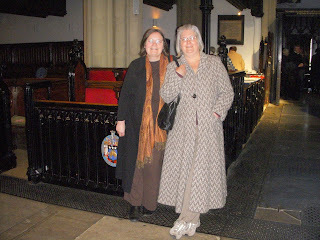 Below is a picture of Erika and Susan after the service, standing in front of the very pew where we were seated. After church, they headed south toward home near Bristol, and I went back to the hotel for a farewell lunch with the Doorman-Priest family. Thank you for posting the link to the bell-ringing. I thoroughly enjoyed listening. What a joyful sound! Pat, it is. Tears come when I listen to it. I cried at the end of the service, too, because it was lovely and because it was good to be there with Susan and Erika. My first thought on seeing that picture of the church, even before you mentioned the changeringing was what Lord Peter said when he first saw the church of Fenchurch St. Peter: "It's a young cathedral!" I did some roaming around on the website. The Choral Diary mentions things like Standford in B flat and Bullock in D. What are those? Kishnevi, I have no idea. I Googled a bit, but I found nothing. Stanford (note spelling) in B flat and Bullock in D refer to choral settings of the various parts of the eucharist (communion, mass) service or of the morning and evening prayer canticles. Stanford and Bullock are the composers. The morning prayer canticles are typically Te Deum 'We praise thee, O God', Jubilate 'O be joyful in the Lord, all ye lands', and sometimes Benedictus 'Blessed be the Lord God of Israel'. The evening canticles are Magnificat 'My soul doth magnify the Lord'(The Song of Mary) and Nunc dimittis 'Lord, now lettest thou thy servant depart in peace' (The Song of Simeon). Susan and I both had the immediate suspicion that we were so swiftly directed to our special seats because they wanted to avoid the embarrassment of us being told by a permanent member of the congregation that "I always sit here". wdg_pgh, welcome and thank you. I hoped that someone who knew the answer to Kishnevi's question would come along and give us help, and here you are. I thought the names may be composers, but I was not sure. Thanks for visiting and giving us the answer. Erika, I would never have chosen the seats myself. Would you? I think not. I believe we all felt a little hesitant. I reek of holiness, because of all the time I spent in churches and abbeys.